Reading this article by Lacey Rose, was an eyeopener (almost as much as this one). The broadcast networks are truly trying to come up with ways to deal with their loss of ratings and audience viewership and one of the ways is by offering original summer programming. The time when they could take summer off and leave show development for the fall might be over for good now that cable has exploited that window to great success with year-round original programming. 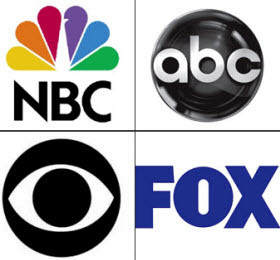 Although the 4 major networks are aware of the dilemma, the networks are going into summer with different strategies based on trying to answer the following question: How to offer originals in a way that's economically feasible at a time of year when viewership and ad money are down? Each of the networks are answering the question in different ways (see below). In turn, the answers made me think of what that could mean for TV producers and production companies developing future projects and which of the current/upcoming shows will blow up, flop or simply just survive. It is vital for anyone looking to get into the TV production game to track what is going on this summer. One thing is for sure, smart producers and production companies pitching primetime shows to network executives make it a habit to know and understand the kinds of primetime programs each of the network produces for its audiences which is why below each of Lacey Rose's answers, I have added a list of the dramas and sitcoms the four networks are currently programming and/or plan to program in the summer and fall of 2013+. CBS is at the more ambitious end of the broadcast spectrum, with the CBS TV Studios-produced Dome budgeted at about $3 million per episode and accompanied by a promotional campaign that included a Super Bowl plug. To make its summertime push work, CBS is relying on a creative mix of digital and international revenue that is said to make the effort profitable from the outset. The company struck a rich deal with Amazon, which will make episodes of the event series available to Amazon Prime members four days after they air on CBS. In addition, the heavily serialized series, about a town inexplicably sealed off by a giant dome, has been licensed in 200 international markets. At this stage, ABC and NBC won't be shelling out as much on production or promotion, but they are just as aggressive about the need to pepper the summer schedule with new reasons to tune in. This year, the networks both will take a shot at lower-cost originals, including ABC's Mistresses and NBC's Camp. In contrast to Dome, which features a sizable ensemble of recognizable actors and a big dose of special effects, Camp was shot in Australia with a cast comprised largely of young, unknown local actors and a budget said to be less than $2 million per episode. "The summer, by necessity, has to be low cost, but it's evolving, and we just thought that this was a soapy summer show with a little edge and a little wish fulfillment," NBC entertainment president Jennifer Salke acknowledges. Increasingly common -- and often more cost-effective -- are the international acquisitions that have come to line the networks in recent years, be it ABC's Canadian co-production Motive and a fourth season of Rookie Blue or NBC's Siberia and Crossing Lines. A straight acquisition can cost the network as little as $250,000 per episode, say multiple sources, but such productions have struggled in the past from lack of buy-in from executives who are more focused on shows they develop. If the network comes in at an early stage and has substantial input, the price tag often is closer to $750,000. And if it's a true co-production, the network will usually shell out between $750,000 and $1 million. With lower up-front costs and thus considerably less risk, Taylor notes, "It's easier for us to keep them on the schedule at a 1.1 or 1.2 [rating] as opposed to in-season where you've got to have a '2' in front of it." Even though the article doesn't explicitly mention it, there is a 4th answer to the question above hinted at in the article. Fox is still a year away from joining the summer scripted fray in any meaningful way* but it plans to do so with a collection of high-profile limited series (24: Live Another Day, the Matt Dillon/Melissa Leo drama Wayward Pines), which several sources suggest will be even pricier. At this point, each network is wondering, will these be the dog days of summer or the great days of endless summer? We shall see... and if we don't, that means those shows were cancelled.